The beautiful Mediterranean-style homes of Cadiz offer the kind of elegant touches buyers have come to expect in a Grande Dunes neighborhood. Built in the mid-2000s, these homes are large with bright open rooms, adorned with marble tile, trey ceilings, and other luxury upgrades. Most homes have 4 bedrooms and feature stunningly landscaped outdoor cooking and entertainment areas with private pools that turn these estates into showplaces. Prices range from about $1 million to slightly under $2 million. 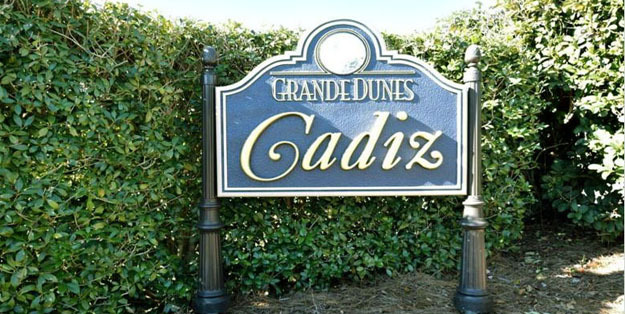 Read more about Cadiz in Grande Dunes real estate. Cadiz is nestled behind a security gate near Highway 31. Residents enjoy the amazing amenities shared by Grande Dune Community; including golf privileges and the incredible Ocean Club with its private beach access, cabanas, ocean front pools, and fine dining with panoramic ocean views. Memberships for tennis facilities, fitness centers, boat slips, more pools and so much more are available to homeowners. Our Grande Dunes real estate expert, Greg Harrelson, is waiting for your call at (843) 536-8383. Contact us today for a tour of the beautiful homes for sale in Cadiz at Grande Dunes.